Robin Deakin’s record on Boxrec looks something like a vial of blood fitted with a green cap on each end. If each red-box loss represented a millimole per liter of blood, then Deakin’s sample has 51 one of them, making him owner to one of the longest losing streaks in boxing history. Deakin earned his second green-cap win when he bested Deniss Kronilovs on points at York Hall in London this past Saturday night. The losing streak began over eight years ago, when Deakin, who refers to himself as a real life “Rocky Balboa”, first lost to Eduards Krauklis in February of 2007. Afterward, a string of 50 consecutive losses followed, mostly composed of four and six round contests (he had one scheduled 8-round bout in 2008 but never saw it past the 3 rd). At one point, the British Boxing Board of Control revoked his license under the belief that he’d never win a fight. The only reason he was allowed to compete last Saturday was because the island of Malta granted him special license. Deakin is now being touted as “Britain’s Worst Boxer”, though I’d argue that the designation might better fit Peter Buckley, another British boxer who finished his career with an astonishing 32-256-12 record. Outside of the UK, there are of course other boxers to consider. Reggie Strickland (66-276-17) and Donnie Penelton (13-166-6) come to mind, though in all fairness to Deakin, none of them has had 51 straight losses on their ledgers. Come to think of it, determining the world’s worst boxing record is much like determining the world’s best. Deakin has had the longer losing streak, but Buckley has more losses. Strickland has the most losses of them all, but has actually faced fighters who went on to win championships. What about the number of 12 round fights? Close calls and bad decisions? These all factor in when determining the best fighters, so the same should be done of the contrary. The reason few bother with these discussions is because history isn’t all that concerned about its losers. But perhaps it should be. One should stop and think about what a win for a fighter that has lost more than 96% of his professional fights means. Here’s a guy that has spent the last 8 years losing, but somehow found the wherewithal to keep fighting until he found a win. Filled on Deakin’s Twitter feed are streams of supporters and well-wishers cheering the fighter on, citing Saturday’s accomplishment as an inspiration to help push through the rough patches in their own endeavors, and to remember the power of self-belief in the face of dissenting opinion. 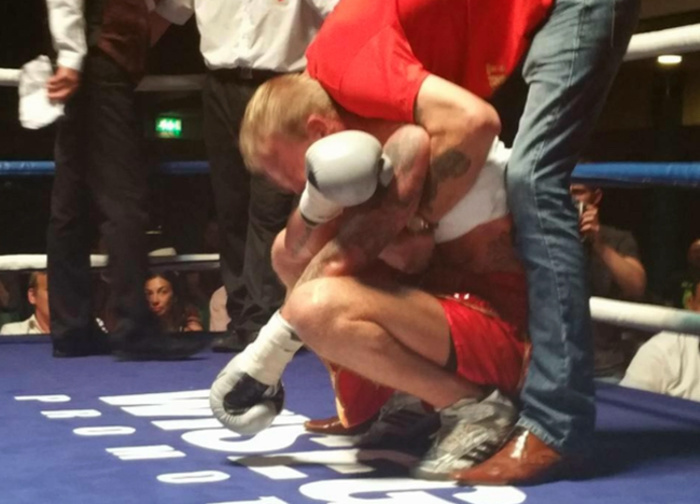 Deakin, in perhaps a naïve confidence, is now more determined than ever to continue his career, claiming that his first goal is to reclaim his British boxing license, followed by fighting more bouts, and then one day hoping to reach a title shot. From the outset, this is a ridiculous proposition, but apparently not impossible. Sandwiched inside his feed is a message from the co-coordinator of the World Boxing Federation offering him a shot at a regional title. Deakin politely declined the offer, saying he “would like to earn [his] shot and be respected for it.” While Deakin’s performances might not show that he understands the mechanics of good boxing, his response shows that he understands the attitude. This short documentary clip of Deakin reveals him to be a nice enough guy, and actually shows pretty decent movement during training. In his amateurs, he won 40 bouts on a 70-bout record, which might suggest that his current losses aren’t completely due to a lack of boxing ability. Turns out he was also born with a club foot, a deformity that took 60 operations to fix during his childhood, so the fact that he’s even walking correctly, let alone boxing, is a feat in itself. There doesn’t seem to be much slur in his speech or physical deterioration, and at a mere 29-years-old, there are probably a few more years left in his physical prime. With 51 losses, I’d argue that he’d be better served pursuing something outside of the ring, though that’s also speaking without knowing much about his personal background. This last fight was his first in 17 months, a time he took off to recover from being stabbed in the neck during a bar fight. It took 12 stitches to close the wound. Who knows what else might happen if boxing is no longer part of his life. Some outlets are claiming this to be the longest losing streak ever in boxing’s history, though that isn’t entirely true either. Alexandru Manea from Romania has fought 54 bouts and lost all of them, so for better or worse, Deakin fell short of that designation as well. Given the dismal record he’s produced thus far, I’m hesitant to say that he should continue fighting, and it’s doubtful he’ll ever reach a shot at a legitimate title. But at least he took a small part of boxing’s spotlight for a short while, and there are now stories written about him that he can always look back on. Not every fighter can say they made it far enough to have that honor.